Prijs € 13,50 (NL) – Outside NL € 20,50. A. G. Orr & V. J. Kalkman. Field Guide to the dragonflies of New Guinea. 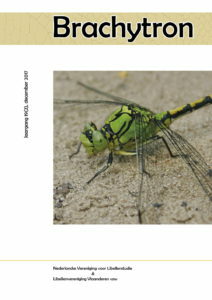 This book is a companion to the ‘Field Guide to the damselflies of New Guinea’ published in 2013 by the same authors and covers the ‘true’ dragonflies, or Anisoptera. With it the reader can identify the approximately 175 species presently known from New Guinea, its satellite islands and the Bismark Archipelago. It will doubtless stimulate people to explore the streams and standing waters of New Guinea and to appreciate the wonderful diversity of dragonflies and damselflies to be found there. Over 400 copies will be donated to universities throughout New Guinea. As well as introducing students and researchers to the beauty of dragonflies on their island, the guide provides a basis to study them and use them in biodiversity studies supporting the conservation of freshwater habitats. The guide contains nearly 250 colour drawings and over 300 line drawings by Albert Orr and 36 colour photographs taken in the field mostly by Stephen Richards. Many species included have never been depicted in colour before. This book is dedicated to the memory of Henk van Mastrigt (1946-2015) who passed away in August 2015 as he was beginning the work of translating the book. If you want to buy this field guide than please contact us.